"Miró: The Experience of Seeing" presents a rare opportunity to introduce American audiences to the astounding and innovative paintings and sculptures that Joan Miró (1893-1983) created in his later years. Comprised of 57 paintings, drawings, and sculptures, this exhibition is the first dedicated to the fruitful period of the artist's life in the United States. The exhibition focuses on Miró's late period with works beginning in the 1960s, a chapter that even today remains mostly overshadowed by his contributions during the interwar and immediate postwar periods. Miró's works during those mature years represent a more personal language, where neither painting nor sculpture takes precedence. Instead, approaching these disciplines again from his original perspective, he set out to explore their conceptual limits by questioning their very nature. The paintings and sculpture in the exhibition closely examine aspects of the art-making process, part of the basis of his output since his earliest works. In his quest to transcend the idea of easel painting, the pictorial space is enlarged across expanded canvas fields, on which calligraphic signs reach maximum intensity through minimum resources, reflecting the artist's attempt to reach a square one of painting through simplicity and emptiness. Assembling found objects, and adding techniques such as modeling and bronze casting, also meant that he could create a work that somehow bestrode all of modern sculpture's possibilities for expression. Without ever being part of any formal categories, Miró continually changed his expressive medium, developing a process of intervention-reaction in the various series that he worked on for extensive periods. The modifications he introduced affected the group's final equilibrium, always reiterating in both media the same conceptual aspects and technical solutions: simplicity, flatness, line, gesture, and ideogram. 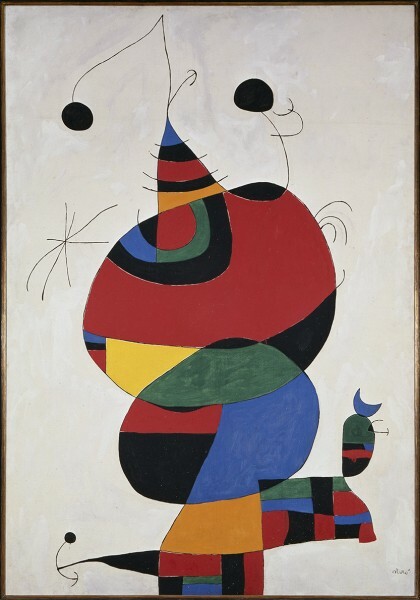 "Miró: The Experience of Seeing" was conceived by Chief Curator of Sculpture Carmen Fernández Aparicio and Chief Curator of Paintings Belén Galán Martín, under the guidance of Rosario Peiró, Chief Curator of the permanent collection at the Museo Nacional Centro de Arte Reina Sofía in Madrid, Spain. The McNay exhibition is the final presentation before the works are returned to Spain.